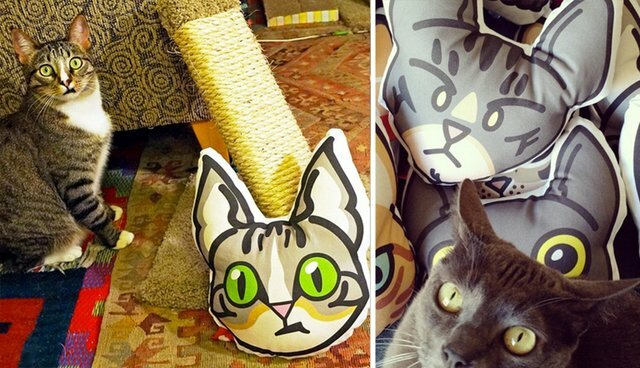 Sarah Clark on Instagram: "Kitty faces: some old some new #petportraitpillows #sewing #diy"
These cozy creations are the brainchild of artist Sarah Clark, who's taken the appreciation of our beloved pets onto a whole new higher plane. While it might have been easier to sell cookie-cutter pillows featuring the same cat over and over, the beauty of Clark's designs is that they're made with one special pet in mind each time. "Every pillow I create is based on a real pet with a real story, and I love to capture their unique personality quirks within my designs," Clark writes online. "Your stories and reference photos help me craft a complete picture!" Just look at all these happy customers. @dcpetportraits on Instagram: "Abraham next to his Pet Portrait Pillow ððð¨ #PetPortrait #petportraitartist #petportraitpillows #petportraitpillow #dcpetportraits..."
Sarah Clark on Instagram: "Olivia meets Olivia. So thrilled that my first new pillow went home with her namesake. This picture is the best #petportraitpillows"
Sarah Clark on Instagram: "Starting to get photos of the custom #petportraitpillows that I made for Christmas gifts! Meet Sasha and her pillow doppelganger =^â¢Ãâ¢^=..."
Sarah Clark on Instagram: "Nothing makes my morning like pictures of custom #petportraitpillows with their real life inspirations! I love that this picture captures..."
Sarah Clark on Instagram: "Pillow pile photo bomb #petportraitpillows #sarahclarkart"
Sarah Clark on Instagram: "Another pillow doppelganger pic came in this morning featuring Lady and Pillow-Lady in the background! #petportraitpillows #sarahclarkart"
To learn more about how you can order one of these marvelous pillows, visit Sarah Clark's website here. Sarah Clark on Instagram: "Lil' pile of puppies and kitties #petportraitpillows #sarahclarkart"